Almost* the entire event was recorded by the BBC with sections broadcast live on the day, the following Saturday, and through the night in 4th November 1985 on The Friday Rock Show. My original intention was to cover the whole festival in one go but Tim has already beaten me to it here. The most informative DP site the Highway Star also has views and reviews. Friday, the previous day, had been the longest day but by the time Deep Purple finally hit the stage, almost an hour later than anticipated, at 22:20 Saturday felt far longer. Audience expectation, despite the weather and delay, had risen to fever pitch and they wanted the main event before the quicksand-like mud swallowed them. I would imagine at least 50% of the audience were in the same boat as myself, fans that had discovered the band after they played their final concert in March 1976, who never imagined they'd have the chance to see A Deep Purple never mind THE Deep Purple line-up that wrote their most famous songs. The band had a lot to live up to and the weather wasn't going to make that easy for them. 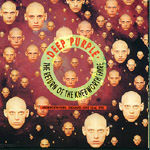 The show marked roughly the fifteenth anniversary of the switch from pop (or orchestral experimentalists) to rock; Deep Purple In Rock was released sometime in June 1970. In Rock, Fireball and Machine Head were all re-released a little in advance of the show in 12" picture disc LP form complete with free A2 sized poster. 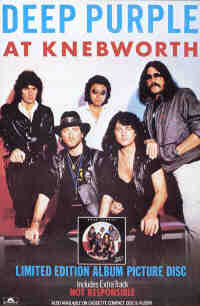 Picture discs were the big thing at the time and Perfect Strangers was also re-released in that form as a Knebworth special edition. Don't these record companies really like to milk the fanbase? A somewhat sadder occasion was out by a week, the final concert of Deep Purple with Gillan and Glover in Osaka Koseinenkin Hall, Japan on June 29th 1973; one of two venues recorded for, and released as, ‘Made In Japan’ the previous year. The rain that had only really stopped for Blackfoot was back on and kept at least one roadie busy sweeping water from back to front of stage, and into the photo pit, throughout the post-Scorpions wait. Water was also tipped off the thick polythene sheets that covered the keyboard rig (stage left as we looked through the descending water droplets). Behind this the stage set was clearly quite basic, some grey boxes about a dozen feet high jutted different distances from the rear of the stage with what became clear was a screen rising behind them. Unfortunately for those at the rear of the crowd the screen wasn't for video projection but instead provided a canvas for some green laser animation. All titles written by Blackmore/Gillan/Glover/Lord/Paice unless noted. Buy the CD directly from Amazon.co.uk to beneift this site (Amazon pay a small percentage of thier profit to me if you click on these links and this will allow me to pay for hosting and more photos)or the DPAS. 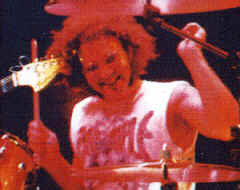 Even on the album the crowd can be heard shouting behind the tape and the cheers rise as the band appeared a matter of seconds before Ian Paice picked up the drum intro to Highway Star. Emotions were running high and the delay had only helped increase their level and, sad though it may be, I have to admit having a tear in my eye as the perfect opening salvo that was Highway Star sped out of the PA.
As befits a song in the BBC Top Gear (the current car TV programme, not the John Peel hosted radio show the band played sessions for at their birth) final Top Five Driving Song vote in the coming few weeks it certainly powers along. Roger Glover’s frantic bass soon joins in followed by guitar from Ritchie Blackmore and live, soaring Hammond care of Jon Lord. Despite the gallons of water poured off the Hammond earlier the valve technology survived and sounded as beefy and full as I expected. 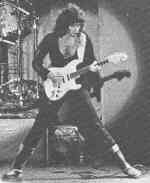 Ritchie, despite sporting a pair of fairly non rock’n’roll Wellington boots, showed fluidity as his hands covered the fretboard with ease. The boys were back and the lack of sleep, the cold, and the wet no longer mattered. It was a good feeling to be sharing an experience so many there never imagined would happen - Blackmore and Gillan sharing a stage under the moniker of Deep Purple. Oh, Ian Gillan, I've not introduced him. I guess he was the reason I'd made the trip; his Glory Road album and In Rock were my introduction to album buying and probably rock music too. His solo band Gillan was also the first live gig I saw and he may well be the person I've seen perform on stage most often. The man has a lot to answer for. Twenty years ago he did his best. A local BBC TV crew recorded the only official film of the show was during this song by. A single camera was used and some of the footage was broadcast on a news programme soon afterwards, possibly the following day. Two on the trot to wake the audience up is an old trick and one not missed at Knebworth as new followed old; Nobody's Home coming from the then current Perfect Strangers reunion album. While not as intense as Highway Star it was still powerful and worked well in its position in the setlist. 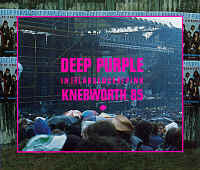 This is a 2LP (and possibly 2CD) bootleg culled from the 'Knebworth through the Night' broadcast. I don't have a copy and it seems pointless finding one with the official CD containing all these tracks anyway. Time for a breather at last as the boys let Ian tell us how amazing we were for lasting the day in the inclement weather, welcoming us to the show, and then explaining that they'd all been doing different things in the intervening years. However, mention of the Gillan band wasn't what followed, Instead we discovered Ian had been learning languages and had become a "cunning linguist", a play on words which preceded one of his many variations, "this time in French", of the story of a Strange Kind of Woman they'd met many years before… Hmm, two tracks from the 'Made In Japan' album so far, not that this wasn't welcome at the time, but the same songs did remain live staples for several years in what would become fairly stagnant sets. Gillan missed a few words here and there but it wasn't too noticeable on the night, just when listening back to the CD in retrospect. What was more obvious on the evening was when Gillan and Blackmore reached the call and return section that worked so well on MiJ. There Gillan matched notes played on the guitar with his voice. On a wet summer evening thirteen years on, and towards the end of a six month tour, his voice wasn't up to the task and multi tracked echo was added to cover the failings. At one point, after a particularly badly missed attempt at a note, the following one was replaced by Gillan laughing at his own blunder. You've got to admire the man for his honesty. In fact the lack of vocal range wasn't as obvious anyway as instead of really overplaying the vocal/guitar duel Blackmore slipped in something that probably confused the 'Deepest Purple' compilation-buying fan, a segment of Jesus Christ Superstar. While they may have recognised the song its significance would possibly be lost as Gillan had nothing to do with that particular song as the character he played/sang on the album was dead. Yes, he was Jesus on the original soundtrack album, a job he was offered after Andrew Lloyd Webber heard Child in Time. We were not to be so lucky tonight as, for about the only time on the tour CiT was omitted from the set. You could blame the late start but I think the lack of vocal range was maybe the real reason. Explanation time. If you were confused by the title of the album the next introduction is where the inspiration arose. As a little prelude to another new track Ritchie started playing something slow and bluesy, though not Wasted Sunsets which many of us would have liked to hear live. 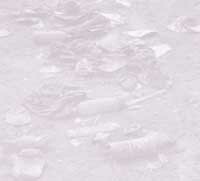 Gillan led into it with "What we all need now is a little, an enormous amount of pink. But, in the absence of some pink here's some Blues for ya." The blues didn't last long, long enough however for the crowd to roar appreciatively as the band explored rare ground, something slow, before stepping up the tempo and power for A Gypsy's Kiss. If Gillan missed the odd word in SKOW here he adlibbed the entire first half dozen lines! Still, on the night a good proportion of the audience were so exhausted or drunk they probably never noticed. The middle instrumental break fair rollicked along with Hammond following guitar licks and then blasting out for a few bars to remind Gillan he was back on in a few seconds. After the guitar dominated rollercoaster ride it was time for a brief pause to regain breath as Gillan told one of his endearing stories that inspired the other confusion on the album cover; Perfect Street Rangers. If you've read closely you'll have worked out what the track should be called (think the abbreviated version: Perfect St. Rangers) but Gillan introduced it as a tale of a football team, the Rangers, who played out of Perfect Street. Daftness aside nothing could hide the solid majesty of the title and one of two standout tracks on the reunion album. In fact, Perfect Strangers is really the tale of the good old days and getting back together again but with a certain distance being maintained. Adding to the excellence here Lord shone, thick Hammond chords filled the damp night as a green laser-formed cage tried its best to protect us from the rain. The beams reflected around the stage between perfectly placed mirrors then out over the crowds heads flickering in time to the solid rhythm of the music. To this day Perfect Strangers remains in the set and, though the Hammond tone differs and the lasers no longer accompany the music, audiences still adore the song. Under the Gun was played here but omitted from the radio transmission and thus the CD release. Another new track, it rocked and went down well but adding Wasted Sunsets in its place may have provided a little more variety to the set. Stepping back in time again, back in fact to that MiJ setlist, and Ritchie played around with Paice, trying to catch him out with several waves of stop-start riffs the drummer was expected to match. Tonight Paice managed admirably and so Blackmore moved on to Lazy. As usual this was a bit of a rest for Gillan's vocal chords, something in a more bluesy vein. Other than a couple of short verses he played harmonica and added to the Glover/Paice rhythm section care of his trusty congas, tonight adding an extra layer of entertainment as the rainwater bounced up and down in time to his pounding. Add to that the swinging head swishing the mane of long dark hair around and he looked like a man possessed. Rhythm abounded as Lazy moved into a showcase drum solo for Paice though quite what the point of the synthesised sounds I still don't know. They certainly didn't add much to the solo. With the jamming out of their system it was time to move onto the other big track from Perfect Strangers, Knocking At Your Back Door. Again it is Lord introducing the new classic though using a synth rather than Hammond. Those swirling Leslies soon had Hammond throbbing through them again as the rest of then band took up the call and Gillan regaled us with symbolic imagery: pocket rockets, and places best left unvisited… I guess his interest in the lyrics is told by the fact he was word perfect for both the big new tracks. Despite the foreign language introductions having been forgotten about as soon as SKOW finished the "cunning linguist" was mentioned in the lyrics here. Glover provides a solid but interesting bass to the others soloing around him and along with Paice kept the momentum going. As the final notes sank into the mud Gillan tried to warm our spirits by announcing the weather report, "the sun's coming out in about ten minutes!" Not that we were fooled of course, it had rarely been out all day so not even JC Superstar was likely to make a difference. Some guitar-sourced cello effects (rotating the volume and/or tone knobs on the white Fender Strat) paused as green light appeared as a point in the centre of the screen. This then grew as Beethoven's Ninth (or Difficult to Cure if you're a Rainbow fan or go by the CD tracklisting) worked itself up from nothing to a Blackmore led crescendo. Over this watched, looked unimpressed, then began to see the merit in a new arrangement, and finally began tapping his foot in time, a glowing cartoon version of Ludwig - a nice humourous touch. The music moved from there into more straight ahead rock jamming before Lord took over with swirling Hammond, a modicum of synth, then down a level after switching to honky tonk piano. Not happy to let things end there it was back with a blast of Hammond and synth together to work towards a 2001: A Space Odyssey climax whereupon the others returned (having left the stage for Lord to do his thing) to journey somewhere the crowd approved of judging by the shouts of approval; Space Truckin'. Should any of the audience have been bored without Ritchie they were revived by some sharp riffing and the rocket propelled rhythm section. Even the echo on Gillan's "yeah, yeah, yeah's" took on a new warped sound. And then the music changed direction, passed through a wormhole maybe, as Hammond and bass provided a step maybe further back into Rondo territory before switching to impulse engines and Emerson territory with a hint of America. Not for long though as Lord was off back to Rondo land for a while before it was time to switch to guitar effects. And the new effect is to spin the sound around the towers that surround the crowd. While not hugely impressive sound wise it did add another layer of awareness that you are there rather than, like myself just now, at home listening on headphones. One final blast of Space Truckin's chorus to end and the band are done, crowd entertained, Made In Japan and the current album suitably plundered. Of course after a nine year wait there was little chance that they'd get away with that; there are still tracks from MiJ we hadn't heard! And so they returned with a snippet of Woman From Tokyo that didn't make the BBC broadcast and therefore wasn't available for the CD either. Woman From Tokyo was played here but omitted from the radio transmission and thus the CD release. Speed King contained the merest hint of Burn, not that Gillan was likely to get involved in that. In fact by the time it came around I was so tired that I didn't even notice it. You couldn't miss the switch into Not Fade Away though before another short attempt, slightly more successful this time, of vocal/guitar alignment and an all cylinders firing blast to an end marked with the first salvo of fireworks. Back came the band for a slightly swinging Black Night while the classic riff to Smoke on the Water unsurprisingly brought things to a conclusion. As the lights and fireworks dimmed, and thousands of people skidded through the mud, there was plenty of smoke in the air - mainly from campfires burning any wood they could find, and almost certainly many of the plastic bottles that had been hurled around the audience earlier in the day. I wandered round in an exhausted state looking for my two friends who I had arranged to meet beside the Mixer tower. For whatever reason we missed each other and while they sensibly went to the railway station I continued to wander round looking for them. I chatted to people and, judging by the mud encrusted jacket the following day, fell over backwards at some point. Eventually I headed for the railway station too though arrived after the last train had departed. I was rather surprised to meet a friend from home who was supposed to be sitting comfortably on the bus that had brought him down. It seems he had managed to lose the bus and by the time he found where it should be it had already gone. Not the best end to the day! You can read his take on the show here. Below are recollections of some friends who shared the experience. Well its all a question of where to start. A very boozy long journey down from Stockport the night before we finally arrived at approximately 1am. We were there! The entrance to the promised land upon which the great event would take place. 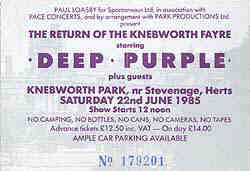 But you really want to know about my recollections of the wettest summer solstice on record Knebworth 85. After being at Reading and Castle Donnington, as it was called in them days, first impressions were how big the stage and P.A. system was and thinking it would be like a wind tunnel when the music started. Unfortunately it was like listening to your neighbours TV next door. It was about this time that the rumour got around that they were going to try for the Guinness Book of Records 'loudest band in the world' once again but the local authorities wouldn't allow it. The stage layout was quite sterile and boring not that I was expecting fire breathing dragons after all it was all about the music. The laser screen was very impressive and the floating DP was simple but effective. Most of the "Perfect Stranger's" Songs came over really well. The full majestic sweep of the title track plus laser's will be a memory I always cherish the effect of which they have never really managed to capture since. The full two hour show seemed to pass in a blink of an eye myself and ninety thousand other people were spellbound, they finished with 'Smoke" Richie and Roger swapping guitars much to Rogers horror. Moments after the finally the 25 thousand pounds worth of fireworks illuminated the sky me being so close to the stage I missed them all but I was assured by people further back that they were impressive. Knee deep in mud rain and golden showers the real fun began when the lights were turned off and everyone began to climb the muddy slope in the dark to were the cars were parked. Now at this point after buying every T-shirt under the sun (now theirs a change) I had 30 pound left which was the price of a tour jacket which I was hoping to buy before I left. After two hours of trying to find my mates and the car in the dark with no joy it was plan B. Should I go to the coach park or get my thumb out. Seconds later this coach appeared out of thin air and nearly hit me and much to my shock a voice rang out with the word's "Hounslow you c**t, get on this coach now!" so without much thought I got on the coach and sat down for the first time in twenty hours. An old friend of mine's friend was driving the coach and they charged me ten pound for the journey home. Needless to say I still haven't got a tour jacket. There are other stories to tell about that magical weekend most of which you already know, but my secretary says she is not here to write a novel. So I am off to listen to the show on my Walkman in the garden. Without the golden showers I hope. This page is Copyright © Doug Anderson 2000 - 2002. Created: 22 June, 2002. Last updated: 23 June, 2005.